When we’re laser focussed on the everyday parts of our business and pushing with all our strength to do all the marketing things, we often lose sight of the big picture. What is someone’s first impression when they first encounter your salon? What kind of basic info are you giving them or not giving them about your business? Are you missing certain pieces in the “path” to discovery? How do people first find out about your business? What do they do to learn more about you before deciding whether to book or not? I hope that you’re asking you regularly ask new clients how they found out about you. Getting that information is crucial. For my own business, I can easily find out how people found me and signed up for my email list. It’s usually Google, Pinterest, or Facebook. But I know that the first impression isn’t the only one. They need lots of different “touch points” with me before they actually become a paying customer (in my case, signing up for one of my paid workshops or courses). In this blog post, I want to unravel that complex process where someone goes from never having heard of your business to booking with you and then becoming a loyal customer. When you understand how this “path to discovery” usually goes, you can make sure that you’re always giving an amazing first impression at every step, so you can welcome even more clients into your doors. How are people actually “discovering” your salon? Like I said, so many salon owners just assume where people found out about them. “Almost all of my new clients come from word of mouth,” they say. That may sound like the most simple thing ever. A friend recommends your salon and then they call you and book with you. But in reality, there was probably a lot more that went into it than you realize. In my personal experience, when I’m looking for a new beauty business in a new town (I have been moving around A LOT in the past several years) - I always ask for recommendations from people, and I get a few. But then, I always hop on my phone or computer and do my own research. I want to figure out for myself if this is the salon for me - or not. And I guarantee that many of your clients do this as well before ever booking an appointment with you. So, even if most of them come from “word of mouth”, you want to make sure that their research is bringing them right to you. In addition to word of mouth, there are dozens of other ways that potential clients can first find out about you online. Through Google, Instagram, online advertising, other websites, etc. Once they DO find out about you, that’s just the start of their journey. More often than not, it’ll take 3-5 different “moments” for them to decide whether to finally go with you or not. While everyone’s journey is slightly different, it’s really important to be aware of all the different places potential clients will research you before coming to a decision. Consumers are more discerning than ever. They will rarely just find your website randomly and decide right then and there to book. So in this blog post, I want to show you all the different places a potential client will likely research you and come into contact with you, so you can make an excellent impression everywhere. This is a true story that happened to me when I found my new favourite hair salon in Ottawa, where I live. I’ve been living in Ottawa for more than a year now (I moved back from Italy where I was living for 4 years) and it was time I found “my” hair salon. Usually, I would get my hair done whenever I visited Italy a few times a year. But I knew it was time to settle down and get my hair done where I live. So I asked my friends and people in my co-working space for their suggestions on where they get their hair done. I kept hearing different hair salon names every time I asked. And I would go on Google to research them whenever I heard of a new place. But none of them really popped out at me. So one weekend, 2 weeks before my big photoshoot (I’ll show you the photos in just a minute) - I decided to do my own research. It took me about 4 different steps in my “research process” to finally find the salon that I believed was right for me. The exact steps and their order will be slightly different from client to client, but I really do think that they are pretty standard. Pay attention to each step, because i give you ideas to make your salon stand out and make an amazing impression at each stage of the “discovery and research process”. I started where 90% of potential clients do: Google. Specifically, on my phone I searched “Hair salon Ottawa” and got a Google Maps view of the salons in the area I live in. I clicked into the Google My Business profile for about 5 different hair salons near my house. Honestly, I was kind of disappointed with what I saw. All of them had under 30 reviews and they were often lukewarm (around 4 stars). What I was really looking for was an all-star salon that has been around for a while and has a really good reputation. I didn’t find that in any of the profiles I clicked into. So I changed my search. I moved the maps results to near my office in another part of town and looked at the results there. I found one hair salon that had more than 230 reviews on Google with a 4.7 star rating. This looked like a very popular place. I clicked into their reviews to read them and see what kind of things people were saying. I was going to get balayage done, so I looked for reviews specifically about that, and saw a lot of really amazing feedback. I also saw that someone from the salon had commented back on all the reviews thanking them and acknowledging them as a valued client. Then I clicked into the photos attached to their Google profile to see what the place looked like on the inside. Bright, modern, clean, and pretty, with large windows. I could tell that the photos were professionally taken, which added another level of “high quality” to what I felt about them. What does your salon need to do for Google Maps? If you look at the first step I took, you’ll understand why it’s so important for your salon to have a Google My Business profile that shows up on Maps, and to take it seriously as a place to promote your business. It’s often the first thing that people see about your business, and if you don’t have certain things in place, you’ll get filtered out and clients won’t take that second step to discovering your salon (which I’ll show you in just a minute). So, first step you need to take is to actually HAVE a Google profile for your salon, and make sure that all your information (contact info, address, name, category, etc) is filled out. This ensures that you simply show up when someone searches for a beauty business near them on Maps. The next thing you really need to focus on is getting lots of 5 star reviews from your clients. That’s what will get people curious about learning more about your business. If you have no reviews, or just lukewarm reviews, they’ll often see your salon but take a pass on it, because you don’t have the “social proof”. Next, most people WILL look into your photos once they’ve checked your reviews. Looks do matter, and we want to see pretty, high quality photos of your salon to understand what kind of vibe you have and how high-quality you are. If possible, invest in a professional photographer to take photos of the inside of your location, and then post additional high quality pics of your team, your work, details of your salon and more. 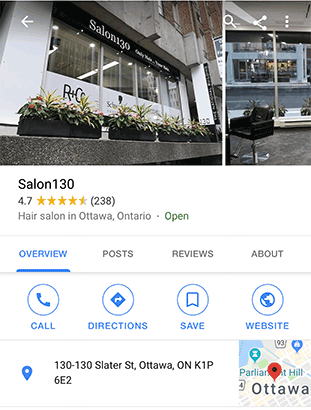 For more ideas of getting more clients through Google Maps, check out my blog post about Google My Business for salons here. If your Google profile did a good job of selling your salon, congratulations! Most people will now take the second step, which is visit your website, which is linked from your Google profile. That’s exactly what I did with Salon 130, the salon I was researching and almost-but-not-quite sold on. I wanted to see if their website was pretty, modern, and worked well, first of all. Because if they had a terrible website that was ugly, old-school and didn’t work well, it would be a sign that they didn’t have much budget to work with, and they don’t pay attention to details or care about their business brand. Fortunately, the website did a pretty good job of selling the business. It wasn’t perfect, but it looked pretty nice. So they passed that test. Next, I wanted to see more details about their services and pricing. I wanted them to do a great job, and I wasn’t extremely sensitive to pricing, so I was looking for a couple things. I wanted to make sure that the pricing wasn’t too high (meaning extremely expensive and out of my reach) but not too low either (meaning that they were a more budget salon and the quality might not be where I want). The pricing looked good to me, so they passed that test as well. What does your salon need to do for your website? Here’s the thing: your salon website does not need to be perfect! It also doesn’t need to be super fancy with cool effects and tons of pages with loads of information about all your services and a boat load of photos. In my opinion, your website can even be a simple one-page site. It really just needs to give the impression that you’re high quality and give the basic information. Make sure that your site doesn’t look terrible from a phone. Most people (like myself) will be looking at it from a phone and if your buttons are all over the place and your test is a mess, it’ll make you look unprofessional. Update your website every 6 months or year to make it look a little more modern. Last thing you want is a website that makes you look like you’re from the earl 90s! So, those are the things to avoid in your website to prevent people from getting turned off. But what are the crucial elements that your website NEEDS to have? Make it really easy to book an appointment at the very beginning of your homepage. I prefer to have a button to book online AND a button to book via phone. Everyone has their personal preference. Have some info and photos about you and/or your team. I’ve said it once and I’ll say it again: people buy from PEOPLE, not businesses. They want to know who you are and to trust you before booking with you. Make sure that your website is branded and has your colors and logo in it. It’ll create a cohesive look to everything you do. Connect your website to your social profiles. I’ll go through why this is important in just a minute. So, to summarize about your website: not only do you need it for SEO and getting found on Google (I’ve got a whole blog post about that here), you also need a solid but simple website because it’s often the second step that people take in researching your business. They want to learn more about what kind of business you are, see your menu of services and pricing, and then if they like it, they’ll be back again to book an appointment on your site (more on that later). In case you weren’t sure, your beauty business needs both a Facebook and an Instagram account. Seriously! This is often the third step that people will take on their journey to booking with you. Yes, these may seem like a lot of steps, but remember that good clients are picky. They don’t just choose your for your prices. They want to know that you’re the real deal: that you’re a salon that vibes with their personality and style. And one of the best ways for figuring that out? Your Facebook or Instagram account. In my journey, after I had checked out Salon 130’s website and was pretty impressed, I scrolled to the bottom to find their Instagram account. Why? I wanted to see photos of their work and learn more about their team before I booked an appointment! I clicked over and looked through the past 30 or so Instagram posts they made. And here’s the thing: I really did want to see photos of their hair they’d done. That was the number 1 thing I wanted. But I also wanted to see other things to. I wanted to know what kind of team they had - what kind of team spirit or personalities their staff has. I wanted to know if they were on top of trends and styles. I wanted to know if they were proud of the space they were working in (and yes, I did see extra photos of their salon I hadn’t seen before). I wanted to know what other kinds of clients they had? People my own age? Older? Males? Overall, their Instagram account gave me a really good feel for who they are and what they do. I was seriously impressed. 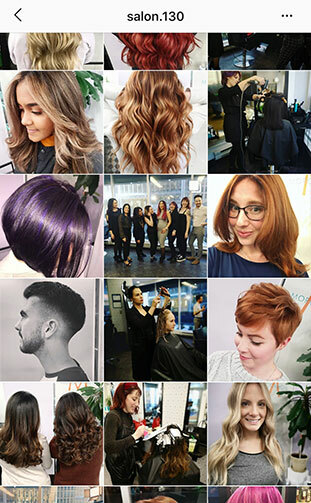 What should your salon do for Instagram and Facebook? So, going back to the website point, you should connect your website to your Instagram account to make it easy to look at your posts. This could be in the form of an Instagram “gallery” on your homepage, or simple buttons at the top and bottom of your site - because that’s where people will look for them. You should also connect your Facebook account to your website. Not everyone loves Instagram over Facebook, and Facebook is a great place to read more reviews about you and see your videos. Then, you want to make sure that you’re regularly publishing good content on both Instagram and Facebook. It’s a natural step for potential clients to take: they WILL creep your social pages a bit before booking. It gives them a more “human” understanding of your salon rather than the polished “businessy” version that you show on your website and your Google profile. So, what kind of content should you be posting regularly on Instagram and Facebook? Well, first of all, the types of things you post on the two platforms should be different. I know it’s so much easier just to post on Instagram and autopost to Facebook, but if you do that, you’re not taking advantage of the differences between them. But you also need variety. You need to show the fun, human side of your business on Instagram. To get more ideas of what kind of things to post, check out my blog post here. Occasional photos of your work, but not cross-posted from Instagram. To sum up, you really need to focus on videos for your Facebook page. To get more ideas of what kind of videos your followers can’t wait to watch, read my blog post here. In my case, once I had looked at the hair salon’s Instagram page, I was sold. I knew this was a great place, it was close to my office, high quality and professional, did great balayage, and was in the price range I wanted to pay. I also felt great about their vibe and personality. I went back to their website to book an appointment. This moment was critical, because if it was hard to book an appointment from their website, I might have gone through that whole journey (which now was around 10 minutes that I’d been researching them) for nothing, and decide to book with someone else. I had the choice to book online or by phone, but I personally prefer by phone if it’s my first time with a business. 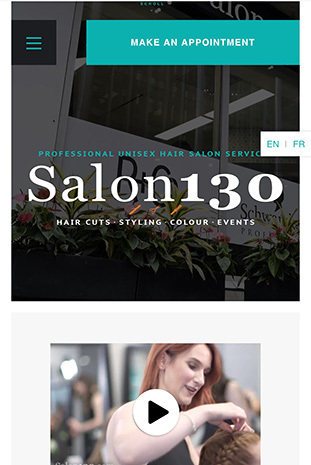 What I WISH is that Salon 130 had a button on their website to book an appointment by phone, where I tap it and it brings up the “call” function on my phone. But they didn’t, so I had to search their website for their number, copy and paste it and then call. For me, it wasn’t very hard. But imagine that when someone’s in a hurry, they might have gotten frustrated with not being able to quickly call for an appointment from the website. So, I called, made an appointment for the next week (and was very impressed by how nice the lady sounded) and that was that! As I said before, you really need to have both an online booking function and a “call to book” easily on your website. Some prefer one to the other, and for some beauty businesses, like waxing or facials, people prefer to be discreet when booking from work, instead of getting on the phone. Make these two things very obvious at the top of your website, and MAKE SURE THEY WORK. I have been on so many websites where the online booking doesn’t work. This is a huge red flag and will often turn people away and make them change their minds. Also, make sure you have your map or address on the homepage of your website so that people can quickly glance at that before booking an appointment. This 4-step process is what happened to me last time I was looking for a hair salon. I did my research, and that involved Google Maps, their website, and their Instagram account. Not every single client will have the exact same “research journey” before booking with you. But I guarantee you that they do their research. 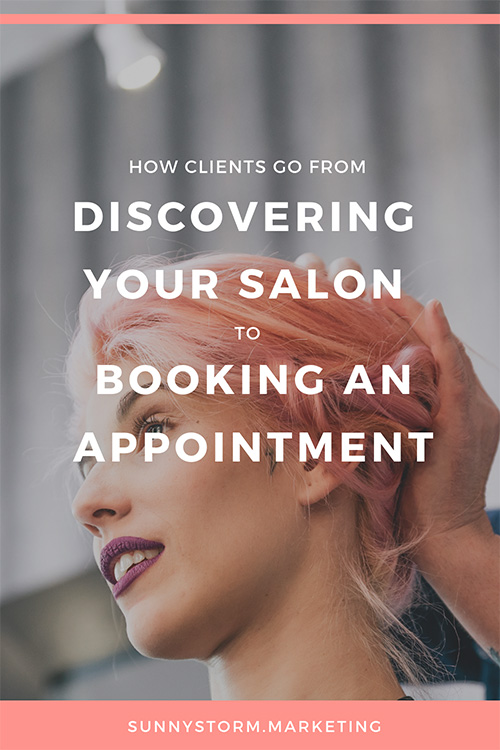 Salon clients are more discerning than ever, they do want to learn a whole bunch about your business before booking. They do want to compare you to other salons. And a huge part of that is your online presence. How many Google reviews do you have? Are they super positive? Is your website professional looking? What’s your menu of services like? What kind of posts do you share on Instagram? Is it easy to book an appointment online? It sounds like a lot, and it is. There are so many steps that are “hidden” from you as a business owner, and you might never know what path someone took to get into your doors, even if you ask them and they say “Oh, my friend referred me”. So be extremely vigilant about all of the online “spaces” that your salon has: your Google Profile, your social media pages, your website, etc. On each of these places you need to give a stellar impression so that every piece of research a client does brings them one step closer to you, and one step closer to becoming a loyal customer.